Joy. Sometimes I fight for her like a warrior. Sometimes I give up and let her go. Joy doesn’t seem to stay, especially during these winter months. So many times I want JOY, but what is the cost? Am I sacrificing the right things? I want joy, so I get up early but then feel tired because I didn’t go to bed early. I try to manipulate my little people – turning on the T.V. or getting games started. But somehow they end up fighting and I found myself needing to parent them. So there goes my moment of peace to read a book. The way to joy isn’t the way we think it will be. Suffering is closely tied to joy. The first person to die for joy to come is myself. The way John the Baptist said the way to joy was for Christ to increase and for him to decrease. The way to joy is first self-denial. I’m not talking about giving up all of your desires. For me, it means joy will come when I stop trying to manipulate circumstances. When I am being a control-freak planner-loving gal, I sometimes get tunneled vision. I forget, I’m not really in control. I plan out my days, my weeks, and my life only to NEVER find joy. I must deny my selfish desires, and let God lead. Trusting my Lord to guide my moments is the first step to joy. The way to joy will lead to the end of myself. It is the joy of the Lord to find strength in him. I will never see God’s strength if I always am doing it all on my own. Coming to the end ourselves will look differently. I can only tell you what it looks like for me. Depression. Death. Heartache. Loss. 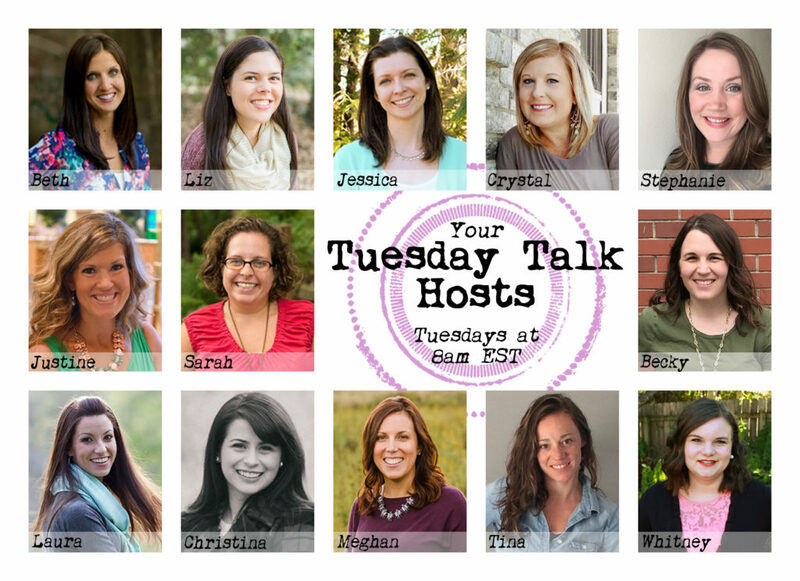 First it was the postpartum depression after my second child was born. It never fully went away when my grandmother passed away. She was the first real loss of my life. It caused such a terrible heartache. A few years later, a rough depression-filled third pregnancy was followed by intense stress from adopting our fourth child with unknown medical needs. The end. Joy is the end of the story. I can honestly tell you I found joy in the middle of all of it. It might have been patches of joy with stretches of sorrow, but joy was there in the moments when I had nothing left. I looked up and there He was. The joy of the Lord became my strength. Joy is truly found in a right relationship with God, but what we miss are the first two steps. We must first confess any selfish desires and then get to the end of ourselves. We don’t have to experience extreme loss or deep depression to be at the bottom. We have only need to say: enough! I give up and let God direct your heart and life. Service for God without joy is a waste of life. Rejoice in a relationship with God – not the work we do. For the joy is found in a close relationship with God, not a successful work. 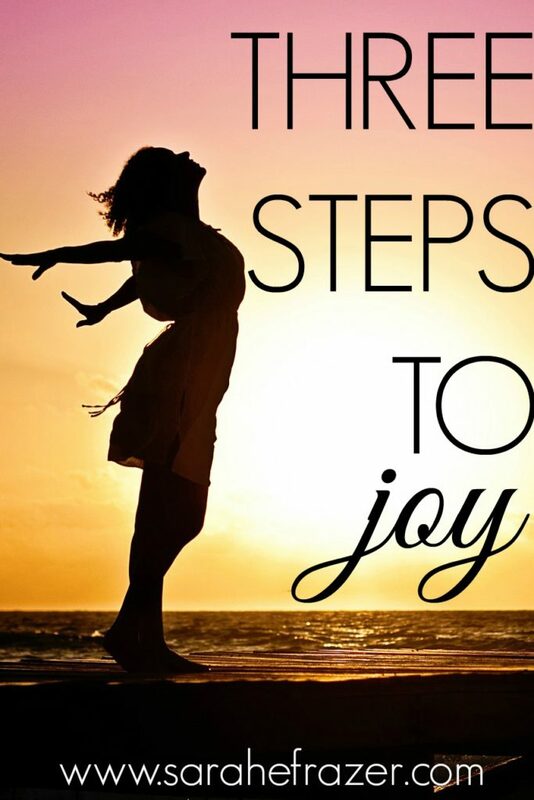 Will you join me today as we seek joy in God? Live a life of joy and start a relationship with God today! In Him you can find your way to joy – today! I love that quote from your post and tweeted it out. or something like that. It impacted me profoundly. He is our joy. When we focus on Him and not the work our joy comes back. Sarah, I’m walking RIGHT alongside you today. Matt. 16:24 is my parking place for this month. Laying self down ~ goodness. Sometimes it’s such a struggle. But there’s hope because our Daddy is bigger and has better. I’m sorry you battled postpartum depression. I’m a sister w/you in that. It’s a nasty bear. Better yet, I love that you’ve found joy. #goJesus Visiting via #raralinkup. Hi, I repinned the beautiful quote card here. And thank you very much for entering my giveaway and signing up for my newsletters. Blessings and much JOY prayed for you today, my fellow Sarah! Loved this Sarah! I taught a retreat on Joy a couple of months ago and what I learned as I studied for it was some of the same lessons. It is found in a right relationship with the Lord, and our manipulation and control only squelch it. Really enjoyed this post. Great job! So grateful for your reminders on joy (especially from another mama who likes it when life fits neatly in it’s well planned boxes!) Dying to self is a hard one for me, but I’m so grateful God is working on me. p.s. my word for the year is joy….so it looks like God’s got His work cut out for Him! 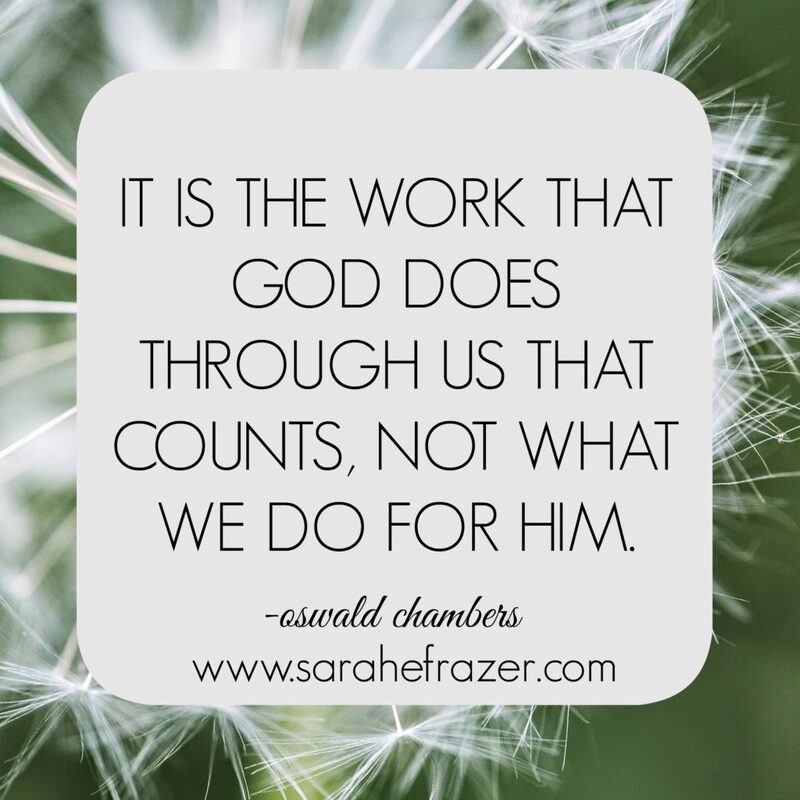 I love that quote from Oswald Chambers! Great reminder to choose joy! Great post, Sarah. We spend so much time looking for temporal happiness, based on things going the way we think they should. But joy, as you’ve said, comes from inside based on our relationship with Him. Thanks for explaining it so well. Thanks, too, for hosting. Blessings! Step three is where I find myself thinking most these days. Oh how I want my first desire to simply be Him, not the joy in doing for Him. I find myself pouring out His love to so many in so many different ways, and it really is such an honor and joy. But if I loose God in the business of serving Him, I’ve lost everything. Thanks for the encouragement and reminder.